According to new statistics issued by the Home Office, theft rates for motorbikes in the UK are far higher than those for cars. In 2003 the theft rate for motorcycles was 37 per 1000 bikes registered on the road, compared to 10 per 1000 for cars. Motorbike insurance comparison site Tiger.co.uk has released some of the figures in more detail. In 2003 the Home Office reported that 50,591 motorcycles were stolen across England, Wales and Scotland. The new data released by the Home Office combined with other sources has revealed some shocking statistics regarding motorbike theft. Police National Computer (PNC) archives, Home Office documents, rider group statistics and information from motorbike insurance companies show that in the decade 1971-81 nearly 45,000 motorcycles were reported to the police as being stolen each year. In 2003 the Home Office reported that 50,591 motorcycles were stolen across England, Wales and Scotland. 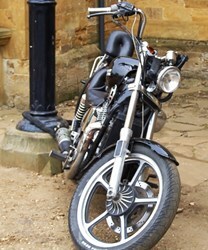 In 2009 a much reduced 26,000 motorbikes were reported as stolen. Encouraging perhaps that theft rates appear to be in decline but for those who have been left without their wheels it is disheartening news that there is a less than 50% chance of getting them back. Shockingly, only 42% of the motorcycles stolen in 2009 have been recovered. Since 1971, 760,000 stolen motorbikes have never been found. To put this into perspective there are an estimated 1.4 million bikes on UK roads currently and, therefore, up to half of these, at least in theory, could be stolen. According to government statistics, popular bikes made by the big manufacturers like Honda, Suzuki, Yamaha and Kawasaki are being targeted by organised crime groups for resale on the black market. These criminals are so practiced that bikes are stolen and resold in a highly efficient manner resulting in very few being recovered. The unfortunate fact is that motorcycle theft is relatively easy. According to statistics from many vehicle crime surveys, half of all riders do not regularly lock their bikes up and a professional thief can steal a bike in under a minute. The other worrying statistic is that a staggering 80% of motorcycles are stolen from owners’ homes. Tiger.co.uk is a trading name of Call Connection Ltd. Tiger.co.uk is a UK based, independent motor insurance comparison site, offering insurance quotes from over 150 motor insurance brands. Call Connection Ltd is authorised and regulated by the Financial Conduct Authority (FCA number 308374).